Released in 1971 Every Good Boy Deserves Favour saw The Moody Blues return to their studio format, the rich plush, luscious production is back. This album was another colossal hit for the band, making it to #1 in the UK, and #2 in the US. The opening track Procession is a rather curious piece, and maybe not my choice. I know that on their previous album A Question Of Balance Mike Pinder had flirted with the then ground breaking Moog Synthesizer, and I am pretty certain that it is a Moog that he is using on Procession. For those of you not familiar with the Modular Moog, this beast stood about 8 feet tall, weighs god knows how much, requires an on site technician, and a PhD in astrophysics to play! This is certainly not an instrument for the feint at heart. For you trivia buffs, there is at least one still in use, Keith Emerson has a working Modular Moog in Los Angeles. Every Good Boy Deserves Favour is an eclectic mixture of songs, there is even a little retro return to Brit Pop in parts of After You Came (track 5). One More Time To Live (track 6) is a highly reflective and evocative piece that showcases just about every facet of this great bands vast musical repertoire. The refrain “desolation, creation, and communicationâ€ very much sums up what was happening to the band at this period of time. The heavy schedule of touring had taken its toll, sickness had caused a number of concerts to be canceled, these guys were heading towards burn out. It was time for some R&R, and that is what they decided to do towards the end of the year.Â A few weeks to regroup and rethink their strategy. This proved to be a wise move as you will discover. You can pick up your copy of Every Good Boy Deserves Favour in better record stores, or online from Amazon. 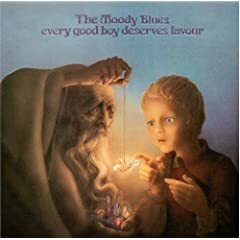 No user commented in " CD Review: Every Good Boy Deserves Favour by The Moody Blues "